DTCC’s MF Info Xchange facilitates and centralizes the delivery and receipt of time-critical mutual fund, bank collective fund and other pooled investment product notifications to reduce risk throughout the communication process. MF Info Xchange, the first communications center of its kind from DTCC’s Wealth Management Services, facilitates and centralizes the delivery and receipt of time-critical notifications, including corporate actions, service disruptions and other critical alerts, which typically require communications from funds to their intermediary partners. Applying technology to notifications eliminates the manual email & fax process. MF Info Xchange effectively standardizes, stream- lines and reduces risk throughout the communication process. The service also includes an event calendar for receivers to view date-critical events, upcoming informational events and historical details. Comprehensive portal supporting many types of notifications. Eliminates lengthy and complex notifications with pre-defined and standardized set of data elements. Event calendar enables users to view date-critical events, track historical event details, and remind receivers of upcoming events, all in one place. Planned audit trail ability to view updates to notifications as well as other client activity performed within the portal. Planned integration with MF Profile Security (centralized data source of comprehensive fund prospectus and operational rules), will enable automatic extraction of fund data and reduce manual data entry. Clients will be able to enter data into either MF Info Xchange or MF Profile Security and have data automatically synchronized between both platforms, saving users time and effort. Any interested financial organization that meets the qualifications of DTCC’s National Securities Clearing Corporation (NSCC) subsidiary can use the service. Clients may access the DTCC dynamic web interface to send notifications. Intermediaries will have access to the event calendar and other features available on the DTCC portal. Please contact Client Support at 1-212-855-8877 or by email at rmsupport@dtcc.com. 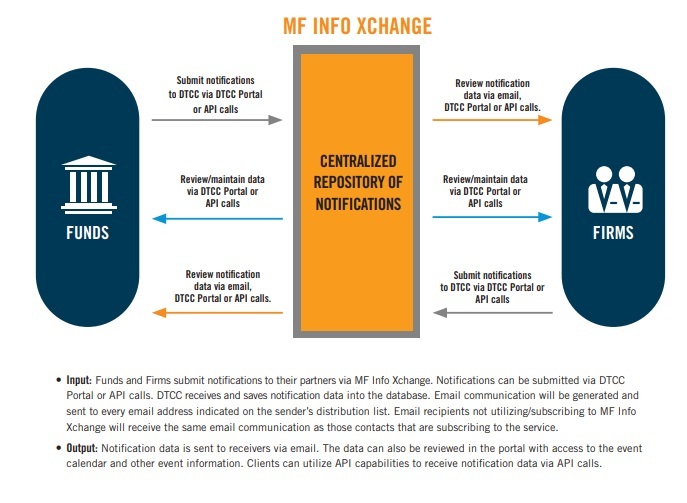 MF Info Xchange is an offering of the National Securities Clearing Corporation (NSCC), a wholly-owned DTCC subsidiary and DTCC itself does not provide such services. The description provided herein is for informational purposes only. This service is governed by applicable Rules and Procedures of NSCC, which contain the full terms, conditions, and limitations applicable to this service. ©1999-2018 The Depository Trust & Clearing Corporation. All rights reserved.